Synthetic peptide conjugated to KLH derived from within residues 100 to the C-terminus of Human Osteocrin. 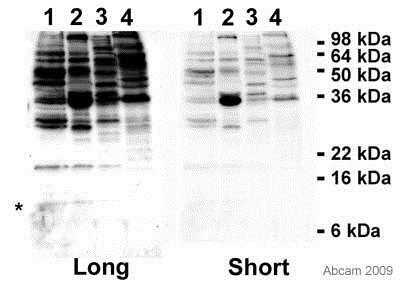 This antibody gave a positive signal in Human bone lysate. Our Abpromise guarantee covers the use of ab39649 in the following tested applications. Appears to modulate osteoblastic differentiation. Could also function as an autocrine and paracrine factor linked to glucose metabolism in skeletal muscle. ab39649 has not yet been referenced specifically in any publications. Publishing research using ab39649? Please let us know so that we can cite the reference in this datasheet.